1952 Life, however, was not as pleasant elsewhere. The differences between the two neighbouring towns of Gibraltar and La Linea continued to be as acute as ever. Whenever any member of the family visited La Linea, they were faced with unpaved roads, hardly any drainage or sewage, and dirty ill-lit streets. Entering and leaving the town entailed running a gauntlet of the outstretched begging hands of the blind, the maimed, the mad, or the just plain hungry. Not to mention, metaphorically speaking, those of the Revenue Inspectors on the Gibraltar side and of the Vista de Aduanas and his carabineros with their inevitable dark glasses on the other. 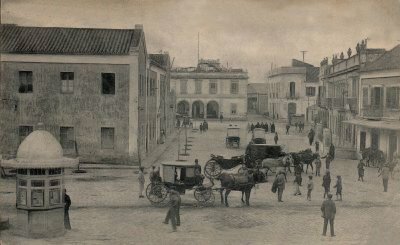 An old postcard showing the aduana area in La Linea. The customs house is the building with the three arched doorways. It was through these that Gibraltarians first entered the town and were immediately besieged by beggars. By the 1950’s many of the buildings on the right were either bars or restaurants. To the people of La Linea it must have seemed extremely galling that just across the frontier, a few kilometres away from their homes, there lived a small community of people who were generally well off, could form political parties and free trade unions, criticise their Government, and could argue with impunity with their unarmed police. 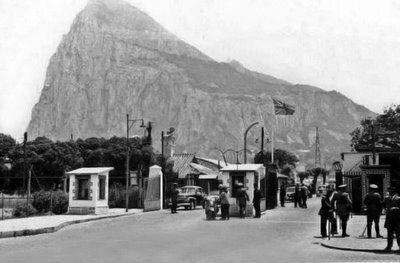 It also seemed as if Gibraltarians enjoyed goods from all over the world, paid very few taxes, had no need to bribe officialdom, and could regard almost every privilege as a right. Right up to the 1950s and beyond, the observations of the 19th century Spanish priest Luis Acosta still held. Despite their political impotence, the Gibraltarian's sense of security was great. The enormous social and economic differences between the two communities had their repercussions. Gibraltar, for example had for many years congratulated itself for its lack of serious crime, and for having developed into a decent and non-violent community. But it could be argued that the social evils of the city had long been exported from Gibraltar to Spain. Modern cities have always had a poor district to deal with. The ghettoes of Gibraltar, along with serious crime, had simply been transferred across an international frontier. The problem was that the Campo area had become a peculiar phenomenon that did not lend itself to ordinary egalitarian political principles. It all started with the anomaly that Gibraltar was a British possession and had been so for the last two and a half centuries. 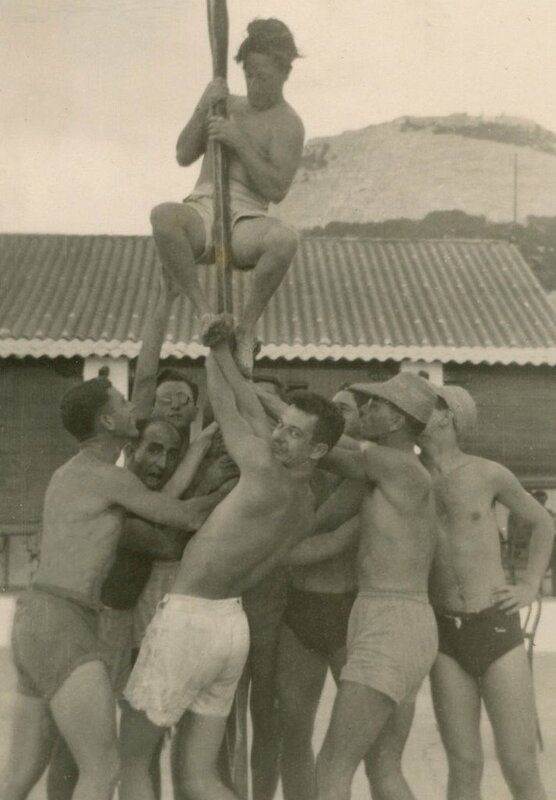 In the process, to complicate matters even further, the situation had given birth to the Gibraltarians, whose ancestors, including all those sundry Chipolinas, Sacarellos, and so forth, had come to the Rock of their own free will. Given the stifling fortress atmosphere, the deprivations of successive plagues and sieges, the patronising maladministration of the British officials and their indifference to the needs of the local population, it seemed incomprehensible that they hadn't packed their bags and moved to more congenial surroundings. The answer in the 1950's was the same as it had been a hundred years earlier. 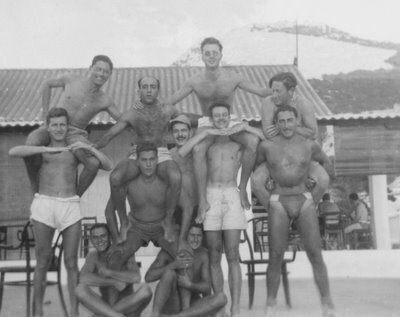 Gibraltar was a veritable goldmine. The city's rich and powerful merchants were not the descendants of wealthy aristocrats. They were the sons of poor imigrants who had simply had the entrepreneurial foresight to cash in on its easy potential. There was an historical parallel with the U.S. theme of 'from rags to riches', albeit on a miniature scale. In Gibraltar of course the 'riches' still derived mostly from smuggling. The locals continued to be the suppliers, the Spaniards the experts at distribution where they made inroads of corruption into an eager Spanish officialdom and generally spread the money in places where there would otherwise have been next to nothing. It was said that there were more pimps, touts, and tramps per head of population in La Linea than anywhere else in Spain. And one could easily believe it. Ironically it could also be said that more money moved in La Linea at the time than in any other town of comparable size in the rest of Andalusia. Most of it was due to smuggling which was known locally as estraperlo. The word derived from the name of a big-time Italian smuggler of the post-war period, when there were shortages of commodities everywhere in Europe. The term virtually eclipsed the pre-war word of contrabando. 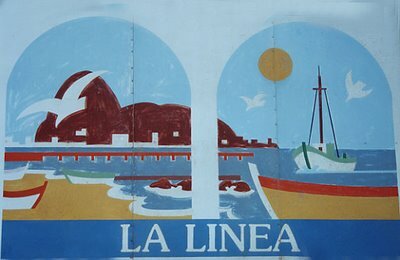 A modern tourist plaque advertising La Linea The view is from an area of the town called Campamento. As usual the Rock dominates the view. 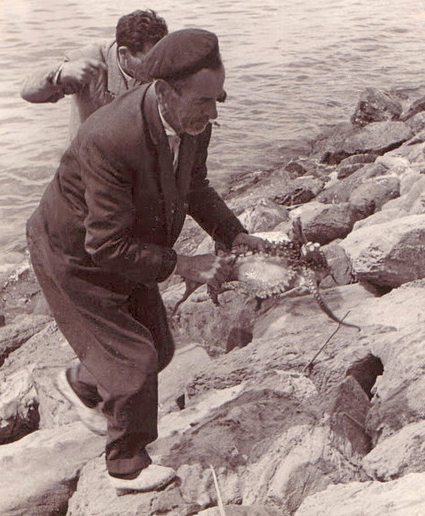 Small scale smuggling was a way of life for most Spaniards working in Gibraltar at the time. In fact many a Spanish workman, who for one reason or another had lost his job, would continue to enter the Rock for no wages at all living off what he could get from petty contraband. Employed or unemployed they all took home their daily bits and pieces, tins of condensed milk, butter, picadura, perhaps even strips of copper or other small items pilfered from the dockyard. One day, for example, Eric watched in fascination as Maria Mendez hollowed out a roll of bread and stuffed the space with butter. The result looked quite innocent. In fact it was quite innocent. These were ordinary people taking home commodities that were scarce or unavailable across the border. The standard 'tip' to avoid a humiliating hand search by the carabineros was five pesetas. The real smuggling, however, was done by the professionals. These were people who came over specifically to take back as much as they could stuff into their garments. The goods were not for their own consumption but for resale. It was a booming trade. The professionals were mainly women and were known locally as matuteras. It was a common sight in Gibraltar to see them at any time of the day in doorways and elsewhere, expertly distributing their cargo over their clothing. Anyone travelling to La Linea by bus was soon forced to confront these shabbily dressed women, their clothes bulging with hidden goods and the whole bus reeking with an almighty and almost overpowering aroma of tobacco and coffee. Neither commodity it seems really lent itself to this type of smuggling. Perhaps the frontier bribes were paid so that the customs officers would turn not so much a blind eye as an indifferent nose at what was happening. 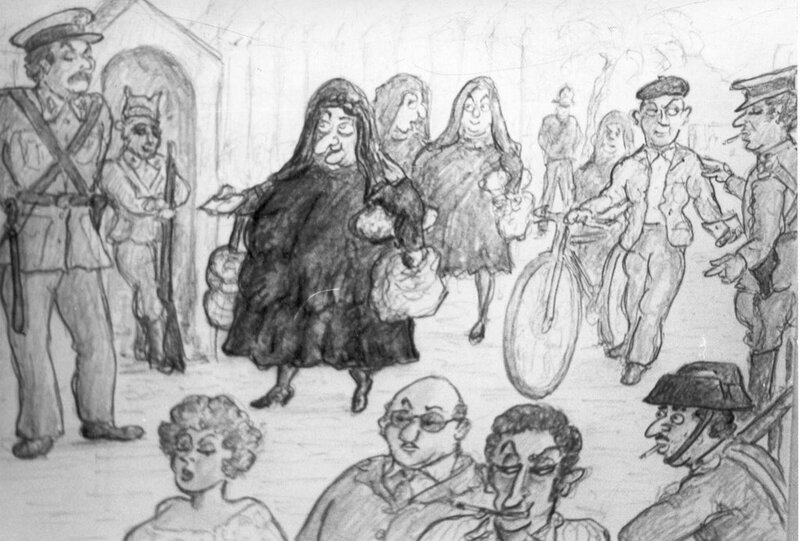 The cartoon is one of several drawn by Eric Chipulina for a series of articles called ‘A Short Expedition into the Gibraltarian Mind’. It was published in the Gibraltar Chronicle. There was also smuggling on an even grander scale involving the movements of tobacco and other goods in bulk by super-launches. Saccharin, for example was a great favourite as there was a shortage of sugar in Spain. Because of its minute size, it was one of the easiest items to smuggle in large quantities. But size and ease of transport were by no means limiting factors. Motor spares and tin plate were also in great demand and the Hotel Universal in La Linea was reputedly built with materials that were pilfered during the building of the Humphries flats in Gibraltar. Considering the size of the Universal, it is more than likely that lorry loads of the stuff were periodically driven through the frontier after suitable negotiations with the carabineros. In fact the possibilities of making money illegally one way or another by people on both sides of the frontier were almost infinite. Spaniards working in Gibraltar, for example, were compulsorily required to exchange their earnings into pesetas at the Aduana at an official and unrealistically low rate of exchange. It was one of the Spanish Governments main sources of much needed Sterling. The problem was of course, easily circumvented. The Gibraltarian employees would officially understate their worker's earnings, giving them a chance to exchange the balance on the black market at a higher rate. Several strategically situated locally financed 'banks' competed with each other every payday to meet the workers' exchange needs, making a small fortune in the process. '..the place – Casa Alfonso - was a noisy, ramshackle, eating house staffed by self-employed down and outs working for their diner and tips, and plagued by every hawker, bootblack and street musician in town. But the excellent meal that could be had for next to nothing compensated for these disadvantages. 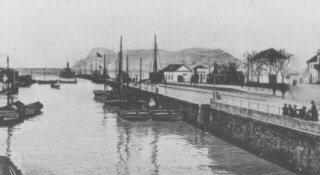 Old postcard showing the Rio de la Miel in Algeciras. The photo predates Casa Alfonso but the restaurant was more or less situated where the neat white house with the three windows is. And while on the topic of eating out, there was a particular dish at the time which was unique to the Campo area. It consisted of thinly sliced charcoal grilled octopus legs. It rarely appeared on any menu but was often served as a tapa. 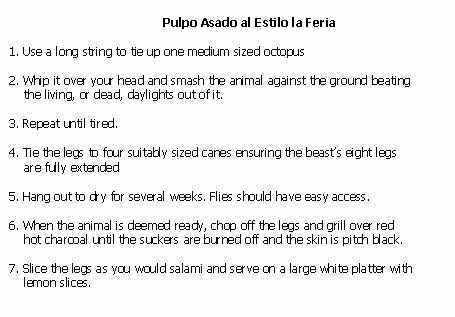 We called it Pulpo asado. Although the method of preparation was rather disgusting, the dish was aesthetically very appealing, with pure, perfectly white circles of flesh outlined by a thin charred outer skin. It had a wonderfully firm texture and a delicate nutty flavour. In fact it was delicious. 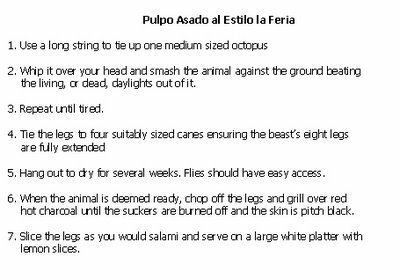 Despite having travelled since then to many other countries in the world I have never come across octopus prepared in this way anywhere else. There were, of course, plenty of other eating houses closer to home in La Linea. One day Eric and his friends crossed the border for some tapas and drinks. As they searched around for a place to park they suddenly remembered that a new parking regulation had recently come into force which allowed parking on the right side of the road on even days and on the left on odd days. Or was it the other way round? Noticing a barber with a rather sour look reclining against the door of his shop they decided to ask him. He waved their question aside with a gesture of disgust. In Gibraltar, restaurants found it difficult to attract local customers. Not only was the food good in the Campo area, it was much cheaper: besides the people usually wanted a change of atmosphere. There was one place, however, that in its day was practically an institution despite the fact that it was rarely visited by the locals. It was called Smoky Joe. The place was owned by a certain Manolo Martinez who ran the place with unruffled efficiency. He was aided and abetted by a group of female cooks who could occasionally be seen working away in a smoky kitchen that probably gave the place its name. The reason for its popularity was that Manolo had done away with all the unnecessary trimmings which one normally associates with a restaurant and had concentrated on providing a square meal at a price that almost anybody could afford. There were several categories of customers including a whole regiment of hungry young soldiers who were quartered in a nearby barracks, the Navy whenever they were in town, and commuting Spanish workers who for one reason or another found it more convenient to eat at Smoky's than bring their own food. It was also popular with yachtsmen from all over the world including the rich and the famous. In fact by popular request, Manolo had a rubber stamp made with the name of the restaurant so that customers from far and wide could have their passports stamped with it as proof of having visited the place. Calpe Crew on the Calpe Rowing Club jetty. Bow – Eric Chipulina – front left. No.2 - Paul Garbarino – front right. No 3 – John Porral – hidden behind Eric’s oar. Stroke – Johnny Alcantara – peeking behind Paul. Cox – John Dumoulin - looking at his stop watch. In August, Malaga hosted the Spanish National Rowing Championships. The finals were held on a Saturday and both the Calpe and Mediterranean Rowing clubs were invited to row in a friendly 'International' which would be held the following day. Eric was a member of the Calpe crew. Urkirolak, a Basque crew from San Sebastian were duly crowned Spanish champions. On Sunday, the first five crews in the Championship together with the two Gibraltar boats took part in the friendly. The MRC were soon forced to retire with faulty steering and the placings were more or less as in the previous day's race: with one important exception. Eric's crew finished two lengths ahead of Urkirolak. The Malaga bigwigs were stunned. To witness the defeat of their new National Champions by a crew from Gibraltar of all places was almost unendurable. In fact it was something they had never really reckoned with. Bouquets, originally intended for the winners, could now be seen floating about in the sea, obviously tossed away in utter disgust. 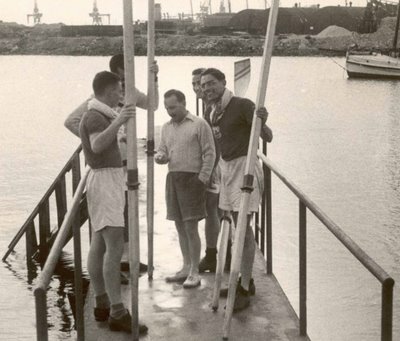 The Basque crew, however, were sporting enough to paddle up towards the winners after crossing the finishing line to congratulate them. Discussing the race in the showers after the race, a Malagüeno friend told Eric that he had spoken to the Basques efore the race. 'En Gibraltar,' he had warned them, 'se rema! He had spoken the truth. A group of members of the Calpe Rowing Club fooling about. Eric is bottom left holding somebody’s leg. The fellow holding the other leg is his good friend Louis Russo. Still at it at the Calpe Rowing Club. Note Eric’s choice of swimming trunks. The crew stayed at the Miramar Hotel, a place full of old-world charm with beautiful grounds and elegant restaurants. After the race, Eric returned to his room to get poshed up and then went down to the garden where he found his fellow crewmen sitting at a table with a crowd of pretty girls. It seems that one of them had befriended a party of Yanks 'doing Europe'. The party consisted of a number of ladies of indeterminate age chaperoning several young girls during their travels. Somehow or other, the girls, presumably with the authorisation of their chaperones, were persuaded to accept an invitation to take them to the dinner dance that the club were holding for the occasion. When Eric finally arrived at the scene with another late-comer they were politely introduced to the rather formidable older members of the party. Eric's introduction to one of the pretty girls included an aside in Spanish. All the trophies for the week-end racing were presented at the dinner. When it was the turn of the Gibraltar crew, they were handed a very unimpressive cup with indecent haste. Inside there were 5 medals which looked as if they had come out of a Christmas cracker. It was a telling detail. Spanish miniatures were always notoriously large and ornate, never mind the trophies themselves. But who cared. The pretty girls were theirs for the night. They were to meet them again back in Gibraltar when the Americans visited the Rock as part of their itinerary. They stayed, of course at the Rock Hotel, the most expensive place in town. That winter after a particularly cold night, Gibraltar woke up to a most unusual sight. The hills across the bay over Algeciras were covered in snow. For a large proportion of the population, including most of the younger members of the family, it was the first time they had ever seen snow. Not since the evacuation had Gibraltar experienced such a mass exodus, as families piled into their cars and crossed the border to have a closer look. The frontier with Spain, known locally as ‘Four Corners’. This is a contemporary photograph taken from the Spanish side. Passes and passports were stamped by a policeman in the small building on the right behind the Spanish policemen.